Left: The boundary vorticity ω at 3 times. Right: the horizon area element sqrt(γ) at the same 3 times. Feeding black holes develop a fractal skin as they grow. 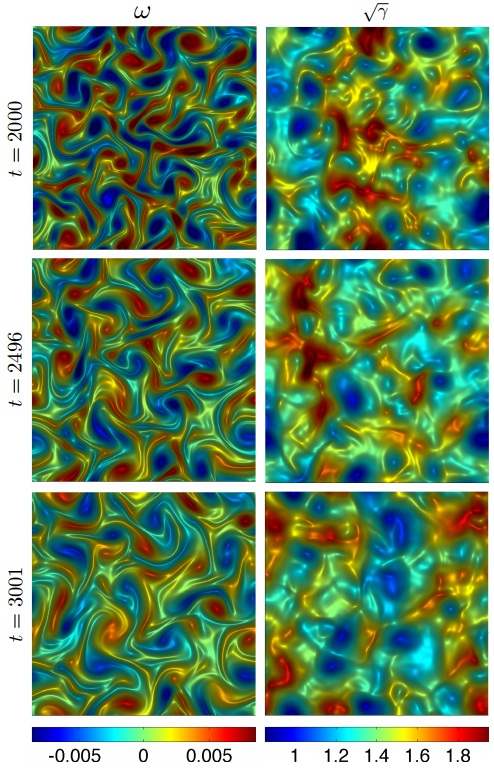 That’s the conclusion of simulations that take advantage of a correlation between fluid dynamics and gravity. Fractals are mathematical sets that show self-similar patterns: zoom in on one part of a fractal drawing, like the famous Mandelbrot set, and the smaller portion will look nearly the same as the original image. Objects with fractal geometries show up all over nature, from clouds to the coast of England. Adams and his colleagues have now found evidence that fractal behaviour occurs in an unexpected place: on the surface of a feeding black hole. Black holes grow by devouring matter that falls into them; the black hole at the centre of our galaxy is due to feast on a gas cloud later this year. But the details of how feeding black holes grow, and how this might affect their host galaxies, are still unknown. To investigate what the horizon of a black hole looks like at mealtime, Adams took advantage of a mathematical duality between Einstein’s equations of general relativity – which describe gravity near black holes – and fluid dynamics. Physicists showed in 2007 that the equations describing fluids and black holes can be translated back and forth. Playing these mathematical games can give insights into both systems – if a particular behaviour is simpler in one regime, it can give physicists intuition about how things work in the other. Adams and his colleagues were curious about turbulence, a kind of churning fluid flow that shows up everywhere in fluid dynamics, from the way milk behaves in coffee to the way air moves beneath a plane’s wings. Led by Paul Chesler, who is a post-doc researcher at Harvard, the team first modelled a turbulent fluid system. They then translated it into the black hole regime and let it develop with time. When they looked again, the horizon of the black hole appeared to have developed an infinite surface area. “That’s the signal of having a fractal,” says Adams. The area is infinite in the same way that the coastline of England appears to have an infinite length – the more you zoom in, the more detailed the shape becomes and so the more space it seems to take up. Because the team simplified some aspects of the model to make the simulations easier, it is unclear how it will translate to real black holes. But if black holes really do grow fractal skins when they feed, signals of this may show up in the gravitational waves they emit. This entry was posted in High Energy Physics, QUANTUM PHYSICS, RELATIVITY and tagged BLACK HOLES. Bookmark the permalink.